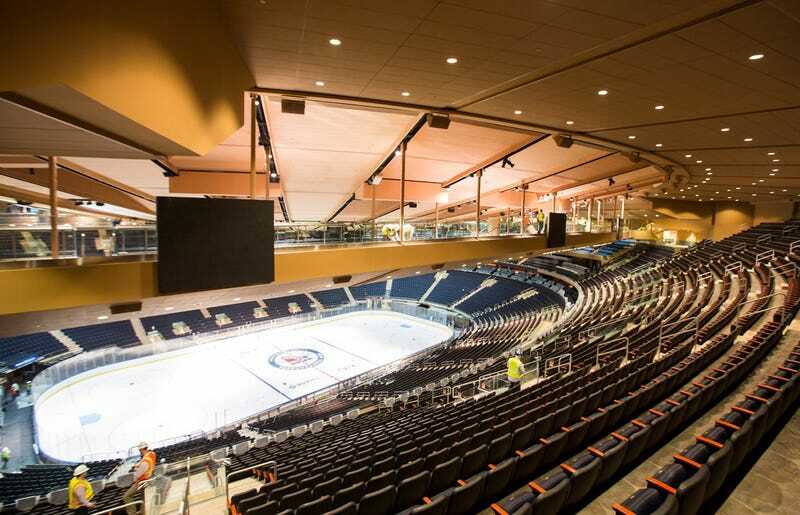 For the last three summers, Madison Square Garden has undergone massive renovations. The most instantly recognizable additions are a pair of sky bridges above the action, and just 11 days out from their debut, MSG has released some photos. They look nothing like the awesome lawsuit-magnets we were promised. That would have been cool. Suspended well atop the lower bowl and with minimal barriers, fans would have actually felt like they were above the action. It could never have worked. First for the inevitable beers chucked to the rink or court, and second for the inevitable drunks tumbling after. So instead of actual "sky bridges" we get what's essentially a 500 level for MSG. It's 430 new seats, with tickets going for $110 to $210. Meaning somewhere about $70,000 a game. The future is here, and it's a cash grab.